kentmartin had the most liked content! 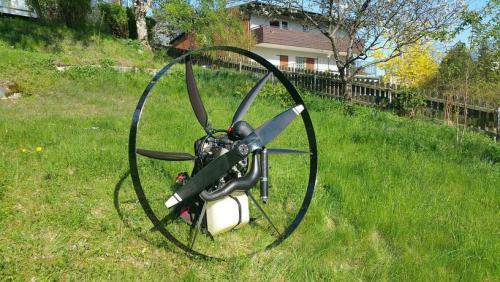 Loads more pictures here https://photos.app.goo.gl/WFhEDKu59mpUr3bH9 One beloved Scout Paramotor. The *only* reason for sale is that I am not a good enough pilot yet, and, I am too scared I will break it. It is in absolutely great condition. Being full carbon fibre, it is extremely light. It has a couple of extras, a fuel sensor, a PPG meter, which shows fuel level (including low fuel alarm), RPM, various engine temperatures etc. It has the Scout SafeStart system. It also has the proper Scout bag/suitcase thing as well as the bags for the various parts - basically everything you need fits in the bag except your wing and fuel. It is super comfortable and can be taken on the plane as extra baggage - about 30kg if I remember right. It has been run on the ground for around 3 hours, and, been flown for around another 7. The Vittorazi Moster 185 engine has always started easily, run smoothly, and, never stopped uncommanded. There's only a couple of things that aren't perfect. I had one landing which scratched a little of the leading edge of the lower part of the cage. It is purely cosmetic and not noticeable unless you go looking for it - see pics. From the same incident, one of the spar's cracked a little. This has been professionally repaired (see pics), and, you can't even see it unless you go looking for it. This really is a great machine, I do hope to have one again someday, but right now I need the money for something cheaper and more in line with my skill level. I'm happy to answer any questions you may have. The pictures were taken on 2018-05-10. There are more pics, all taken at the same time, here https://photos.app.goo.gl/WFhEDKu59mpUr3bH9 It is on the ground in Stockholm, but I can easily arrange to take it to the UK (I'm popping over in 3 weeks as it happens) - I'm a Brit living in Sweden. So - buying a Paramania Revo 2 (M) here in Sweden has become a bit of a saga. By way of background, I ordered one about a month ago from a dealer here in Sweden - a Medium in Fresh colours, which was the last one they had on the shelf. The dealer placed the order with Paramania and had payment to them 3 days later. After much faffing about over the last month with promises of tracking numbers and whatnot (he's showed me some of the correspondence) we still don't seem to be any further along the process apart from saying - ah, we sold the one you said you could have while the payment was working its way through the banking system, and now we're moving factory. He's said to me he won't hold it against me for pulling out at this point (and to his credit, he didn't ask me for a penny yet). He also mentioned that he's had someone grounded waiting for a couple of lines for over a month, and worse still, one guy who is still waiting for an order from January (although I think that might be for a new product that they promised would be available shortly, but hasn't materialised - GTX 26 I think). What makes it particularly irksome, is I ordered this so I'd have something to fly while my instructor is away (other instructors supervise, but I can't use their equipment), so I am missing some gorgeous flying weather, and, delaying my progress pretty significantly. Bit of a longshot, but I am wondering if any dealers who read this forum have any in stock? I figure the dealers are obviously all absolutely coining it and probably keep several 10s of thousand of quid worth of stock sitting on the shelf! (Like I said - longshot). Or, alternatively, if anyone has a second hand one in decent nick? Ideally in the colour scheme 'Fresh'. I should also note that I am not looking for another brand (or even size) as I am severely limited in choice by the regulations in Sweden (needs to be certified in the right size, and, by one of the small subset of certification organisations they accept). Thanks! Stick kicking and wing over practice..
kentmartin replied to Henrik_Y's topic in Paramotors. Lovely.. and love the name! The Raspberry Pi is interesting in that it is a very small (credit card sized), very cheap (< £30) low powered computer (has roughly the same processing grunt as an iPhone 3G if I recall correctly). What's worth remembering is this is more than enough processing power to run lots of things. One of them would for example, easily power this forum including the webserver, network connectivity, and back end database. It isn't difficult to see how one could strap one onto one's paramotor and have it doing realtime analysis of the information coming in from various sensors. It could also easily log all the information for later collection, and of course present it via one of the displays above, or on any display that take HDMI input (like your HD TV or computer monitor - the latter maybe with an adapter). If you had a 'proper' display the power requirements would likely escalate a fair bit, but the rest of the system would run on the sniff of an empty battery. I forgot to mention in my first post that if anyone is thinking of buying this stuff, be warned.. I didn't really think of it, but Switzerland is part of Schengen and free movement and whatnot, but not part of the EU. This means that you might get hit by the tax man on incoming post (same as buying from the US for example). When I bought maybe £50 worth of stuff to be delivered to me here in Sweden, the taxman got me for about another 300 SEK (£30) - ouch! Folks, I've been doing a little work project lately using products from Yoctopuce (http://www.yoctopuce.com/) I've been using their Yoctoknob (for a non PPG related application) which essentially measures resistance in real time across 5 circuits. I can only vouch for the Yoctoknob, which does what it says on the tin. I can also vouch for the API which is top notch and a doddle to use. The guy I have been dealing with there (Marcus) has been really helpful with any little questions I might have. They have a range of other sensors, relays, actuators, as well as some little screens, that, along with a Raspberry Pi a little battery and a little box to stick it all in, would lend itself well to building (and coding) your own custom instruments to do whatever you want them to. The Yocto-Meteo sensor is of interest (temperature, air pressure and humidity) (http://www.yoctopuce.com/EN/products/us ... octo-meteo) as is the thermocoupling sensor http://www.yoctopuce.com/EN/products/us ... ermocouple (CHT, EGT?). I also wonder if the servo controller could have some interesting applications in conjunction with the other sensors. Finally, the screens look pretty snazzy. http://www.yoctopuce.com/EN/products/ca ... b-displays Anyway, if you are interested in coding up some solutions or whatever, I'd recommend checking them out. Unfortunately my nerd credentials are much better than my (non existent) spanner credentials, so, doing tricky things with engine management would be beyond my skill range, however, if someone has something they want to do, I'd be quite happy to help with the code. I don't think this would be much good for pure instruments that already exist, because it just isn't cheap enough (1 CHF = 70p). For example, a Vario would be easy to make, but would cost more (and depending on your packaging skills, less robust) than an off the shelf one. If you wanted a vario that did something different based on, EGT for example, then, this would be a great way to do it fairly cheaply. Seeing this stuff, it makes you realize how cheap off the shelf equipment (sometimes) really is! I also can't vouch for this stuff's robustness, although, no moving parts, so I can't see why it wouldn't be fine. Cheers, Kent. You are very likely right on both counts On the other hand, I like to try and keep the bastards as ethical as possible, and this is the only way I know to do it, I think the price is one worth paying. I might be able to help a little here as I've been researching this question. It appears to me to come down to 3 main choices, the Sony, the Contour range or the GoPro range. Gizmodo has a great review of a bunch of cameras here: http://gizmodo.com/5965732/the-best-action-camera I don't consider that the end of the story though... I refuse to buy Sony because of their to my mind abhorrent business practices (see their complicity with and funding of the RIAA and the BPI, among others - truly evil organisations), not to mention their rootkit debacle and various similar incidents where one can come away with no other impression than they hold their customers in contempt. I was seriously considering the GoPro - and was going to get it even though I really like the option to use your phone as a wireless screen on the Contour +2, then they started playing corporate silly buggers as well... threatening lawsuits for pictures used in reviews. http://news.slashdot.org/story/13/03/21 ... ive-review Given that the only thing these companies understand is voting with one's wallet, and given that the Contour +2 looks like a very nice product (and I like the look of their GPS mapping SW), I think that's what I'll go for.